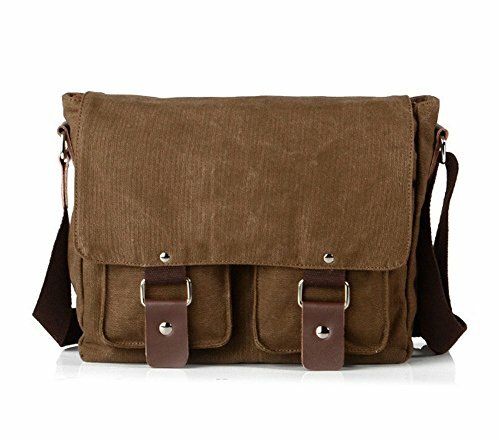 This messenger bag is made of cotton canvas and cow leather.Vintage bag is suit for school,outdoor and so on. ✓ Leather Zipper--Full-grain leather, more comfortable and anti-skid. ✓ Magnetic Snap Closure--Bag opening with magnetic snap,more convenient. ✓ Sturdy Shoulder Strap--The end of strap with leather biding,easy to support the weight of bag. 1.Thanks to the manufacturing process and the natural smell of leather,the package you receive may has a little bit smell.You can open the package and put it at a ventilated place for few hours,the smell will fade away gradually. 2.The most significant feature about Crazy Horse Brand bull leather is disordered scratches on the surface,which is the style of retro and wildness. 3.However the leather has high quality,it is unavoidable to have small scratch on it.The leather will looks better,if you use hand to wipe it gently. 4.Since the manufacturing process of Crazy Horse Brand bull leather,the color maybe a little bit different of each bag,please be aware of this and confirm with our customer service before you purchase.